Waterproof Reusable And Discreet Wheelchair Seat Pad. These re-usable seat pads have been specially designed to look and feel like a normal seat cover to preserve user dignity. Manufactured from a superior absorbent, stay dry material with a slip resistant backing, the pads protect both user and seating. 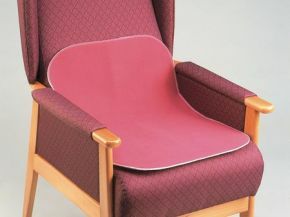 Can be used on an armchair, small dining chair, a wheelchair or even in the car when travelling. Designed for light to moderate incontinence, these pads are machine washable.